Our strategy is to focus on education, as education enables us to make decisions which positively affect our life. Recent studies have shown that educated people have well functional social networks, are less likely to be unemployed, and use their leisure time more effectively. Local Volunteers: Through the initiative of mainly local volunteers we contribute to youth and community development. 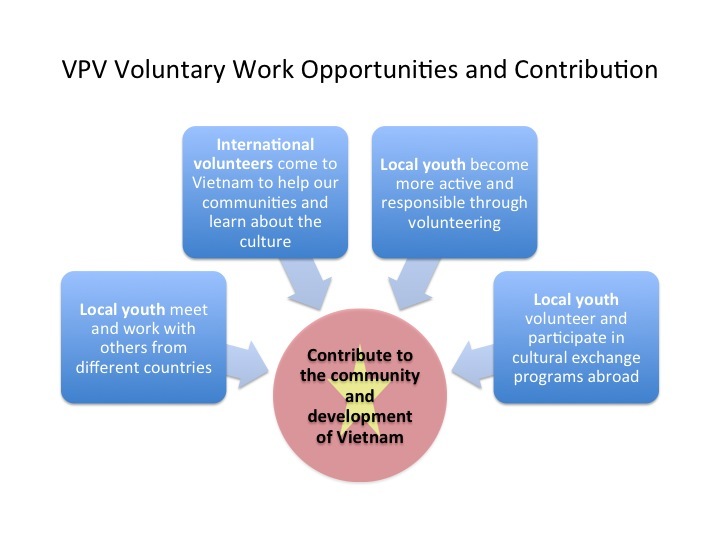 This includes programs for Vietnamese to volunteer abroad (for details refer to the ICYE section), to participate in the VPV Club, which organizes events to promote volunteer work, or to take part in training and development courses (i.e. project management, leadership training, cultural diversity). Education: VPV covers both basic education at primary schools, such as foreign language courses in French or English, secondary schools, tertiary level and universities. Social Work: Includes childcare at nursery schools, orphanages, or specialized schools for mentally disabled, i.e. for children suffering from the after-effect of Agent Orange. 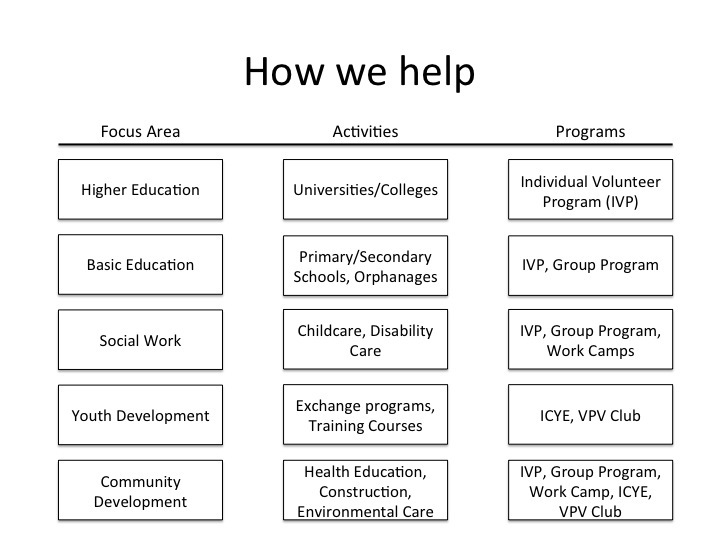 Youth and Community Development: We work with local NGOs and social enterprises. Activities include health education, LGBT awareness, construction/renovation, environment/organic farming, exchange programs, and training courses, such as leadership and communication training. 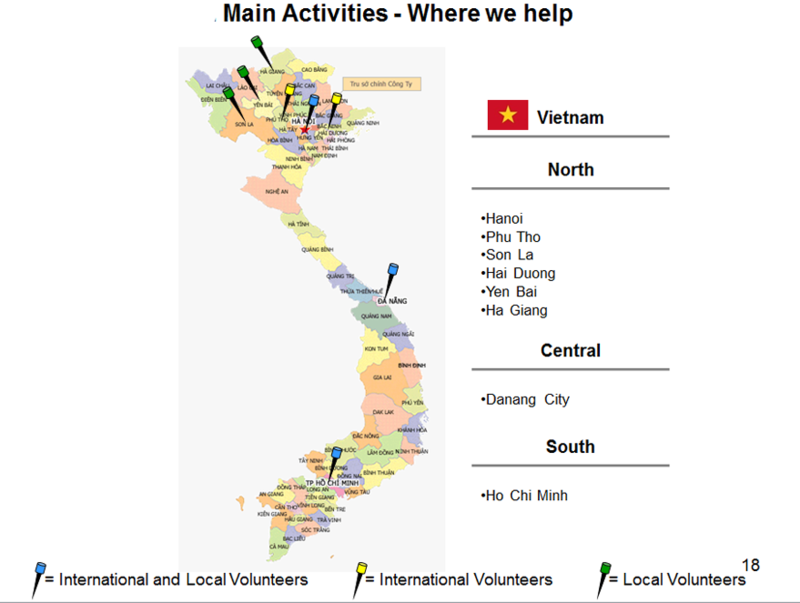 We offer dedicated programs for all of the activities listed above – please refer to the Projects for International Volunteers and Projects for Local Volunteers tabs for more information.